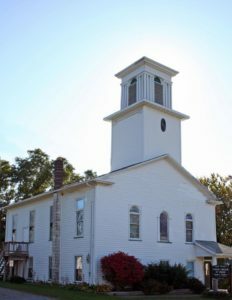 LIVONIA — The South Livonia United Church of Christ is celebrating 200 years this month. The church’s 100th anniversary was celebrated on March 14, 1916, the exact centennial of its founding, when 81 people shivered on Conesus Lake and cut a hole in the ice for baptisms. This year, the church is opting to take advantage of the warmer weather. The church was first organized on March 14, 1816. A group met at a local school, and local resident Timothy Baker donated land for construction. The structure has had a few facelifts and updates to keep it feeling spry. 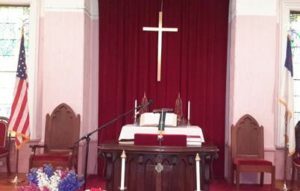 In 1874, the pulpit was changed and galleries removed. In 1921, plain glass windows with green shutters were swapped for stained glass. The eight windows installed in 1921 (plus another installed later) were each given in memory of family members. On July 8, 1922, an all-day service formally dedicated the windows to family members. Celebrations will be the weekend of Sept. 17. Taft said in a press release that on Saturday Sept. 17, at 2 p.m., the church will have a ‘Sing-A-Long’ with their own Martha Gannon on Piano. At 3:30 p.m., there will be a BBQ Picnic catered by 3 Legged Pig. Cost will be $12.00 per person. Checks are payable to South Livonia UCC, to be mailed to Mrs. Sally Brown 5948 Federal Road, Conesus, NY 14435. The church asks that payment be sent by Sept. 10. Then on Sunday Sept. 18, the church will have a regular service at 10 a.m. A light lunch will be served at 12:30 p.m. and at 1 p.m. there will be a special service by Jim Culbertson to present the Proclamation. There will be stories of the church’s ‘Famous Turkey Dinner,’ the ‘Minister That Made Pickles Popular,’ Native Son Shang Reynolds And Changes To Our Church Building.